Yesterday was a lovely sunny day, so I took a walk along the Loire. 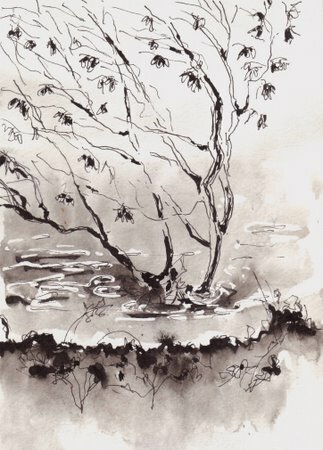 I thought of Robyn, who did a watercolor painting and an ink drawing with a beautiful tree in her scene. I remember thinking that I’d like to take on trees, so, I took out my unipen and looked for trees to draw. I’m afraid of trees, so this was really getting me out of my comfort zone. I find them complicated and I never know where to begin, what to put in and how to depict those intricate branches, not to mention the odd dry leaf still hanging for life, the magnitude of dead twigs intertwined like spiderwebs, the stunning moss growing on the shady sides, the windswept bending to nature’s unforgiving blows. I just find it hard. I did four and then realized I need to do many more tree sketches to really grab hold of the character of a tree. In fact, next year one of my goals will be to take on plein air, piece by piece, studying trees and rocks, foliage, texture in nature. These are actually my first ever trees and now the ice is broken and the work awaits! 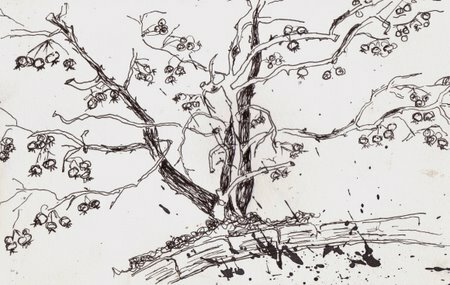 An old split-open tree with a lot of spiderweb twigs hanging , which I tried to depict by a fine spray of black and silver ink at home. Moleskine. This is my favourite tree, the Tilleul(along with the oak). I just love their statuesque shapes that change from season to season. In late winter we just simply call them knot-trees, because they are pruned back to the thick knots, which some people find grotesque, but I think it’s beautiful. Some day I’ll do this tree again and hopefully do justice to it! Done in brushpen and I splotched some brushpen sprayes on the thick trunk to depict the beautiful moss. Moleskine. I LOVE YOUR TREES, Ronell! They have such a magical quality about them .. I’m expecting elves any time … They seem alive and so vibrant and filled with energy!!! BRAVA! A beautiful exercise. I am especially in love with the first one. so creatively done. wow Ronell, you’ve created such beautiful scenes. I really do love all of them. great work! 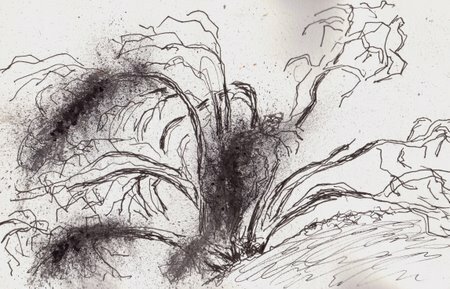 Lovely sketches of the trees, Ronell. You’re right about trees having plenty of characters. They are fascinating subjects, aren’t they? These trees sketches are great! I love the first one just hanging there on the bank of the river. The sketches of the senses are SO COOL!!! The block depicting each part of the face is just such a wonderful concept! Ronell, you have been busy creating lately and seem to really be in a flow with these ink sketches. I can’t believe these are your first ever tree sketches. You did a fine job depicting the differences of each tree. They all look lovely in their own way. I like the knot tree best…maybe because I feel so knotted up lately. I think it good to go out of our comfort zone, good to be critical of ourselves at times and then go on. I would have enjoyed that walk with you. I’m proud to have I nudged you in the direction of trees, Ronell. These are beautiful, and so well observed – I particularly love Tree Standing in Water and the Knot Tree. Your Knot tree is very Van Gogh. I’m wondering if these are the same as the trees we have here which were traditionally companions to the grape vines. I’m impatient for Spring now so I can ‘follow’ you into the French countryside. These drawings are wonderful…what a great quality of line. I especially like the brushpen drawing. I so love your ink drawings. They have great dignity and presence. I alos think your mark making is very playful. Must try myself!!!! You inspire me. What exquisite drawings! 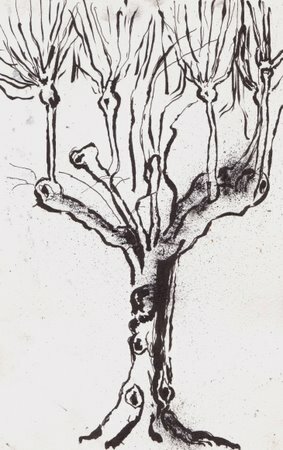 I can’t believe you have no experience of drawing trees, these are so full of life. I find trees and plants daunting and get overwhelmed by the details. You’ve done a fantastic job! Ronell, these are great. I especially like the frist and last ones. The way you illustrated water was wonderful. I think you did the last one justice this time!! Good for you! and a lovely job you’ve done of it too. I love the moody feel to the water in the first one. These trees are not the work of someone who is afraid of trees! If I had to choose a favorite one, it’s the one standing in the water, but I love them all. Great ink. It sure is inspire as lindsay say. Love, love, love these! I’m amazed at how I get such a “wintery” feeling just looking at them. Beautiful! thank you for all the supposrtive comments everybody! Trees are fascinating, I can’t believe i haven’t done them before…not to mention good exercise. As everyone says – I think these are coming along really well – the first is my favourite. I love trees, but yes I too find them intimidating – knowing what to put in and what to leave out is difficult but i think you’ve made some great and effective choices in these. These are great, Ronell. The ink works really well on this subject too – and each one has so much character. The trouble with trees is always what we leave out, how we simplify, which I find particularly challenging. But you’ve done it perfectly. They are beautiful, Ronell. I especially love the first one with the water ripple accents. Lovely stuff! OHHH, gorgeous!!! They take my breath away, Ronell! These trees are beautiful. I really like the scene you’ve created in the first drawing. The tree feels alive and the water is really well done. Hi Ronell, What wonderful pen and ink drawings. You’ve captured the unique quality of each tree. I particularly like the crab apple next to the Loire as it gently leans to the side. Thanks for sharing your lovely work with all of us! Ronell, they look great but the 1st one is so tender and beautifull! And I wish you a Merry Christmas and the best for 2008. I’m trying to understand why you’re afraid to draw trees. It’s sure not based on these because these are beautiful. The ink wash fits perfectly. I can relate to the fear of drawing trees. I dread them. I really like your take on them. Your lines are confident and the results are more than promising. I look forward to seeing more. How did I miss these beauties! Vivien certainly gave some of us a big shove! It’s good to see your trees and to know that you struggled, too. Next Next post: A peaceful Christmas to all.